Some craftsman back in the day needed a way to carry his 3/8 set around. 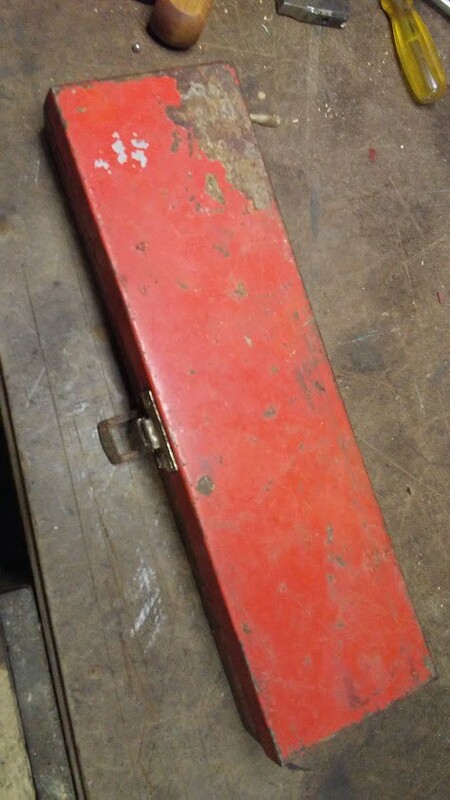 What he did was make a wooden box that incorporates the speed wrench as the handle. All of the tools are early Craftsman. You boys better hold on cause I'm gonna have to stand on it! Oh yeah, I like that too! I recall seeing that before somewhere. Pretty clever on someones part. The spark plug socket arrived today to complete my Sparta (New Britain) set. Holy smokes that looks like it just came off the line. Thanks. 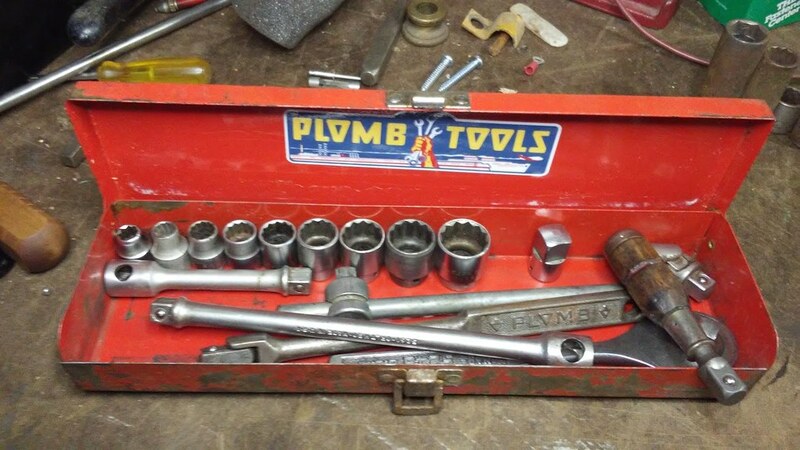 I had picked up the socket set at some estate sale and wasn’t sure what to do with them. Four.cycle mentioned that they were somewhat rare so I thought it would be nice to complete the set. 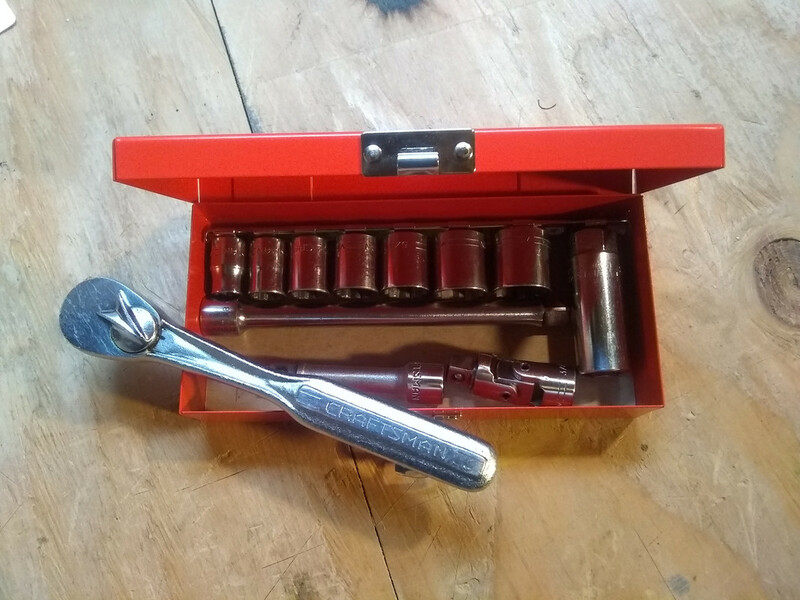 I found the nice box with two extensions on eBay and found the ratchet and 13/16” socket there as well. The spark plug socket seemed to be the final piece and was in nice condition so I grabbed it too. It is astounding the stuff that is out there. I have this set almost complete, all I need is the correct 5/16" socket. I received a couple of almost complete Thorsen 3/8” drive sets from my tool collecting buddies recently. I was able to complete the regular deep set but will be looking for a 19mm for the metric set. Here they are along with some other early and later Thorsen 3/8” drive sets. Wow -- that is quite a haul! Great sets and a really great brand. I'll look through my odds 'n ends socket drawer, but the I think the only Thorsen deeps that I have are the 1970s Montgomery Wards Powr-Kraft era Thorsen. Here is a Walden 1/4” & 3/8” drive set that I completed recently with a little help from an eBay seller. His extras matched up almost perfectly with the ones I was missing and the price was right. Here's my Craftsman flying V 3/8 set. Everything is V, mostly =V= except the 5/8 sp socket which is -V-. The box is a new PROTO 1/4 box. I know the decal I've got on it isn't exactly period for a Flying V , but I couldn't find a crown logo and I quite like this 50's Craftsman logo anyways. Only a purist would complain. That came out very nice and something to be proud of. Sometimes minor details have to be overlooked and I doubt very many would know the difference anyway. I am not familiar enough with the Craftsman logos and timeframes to know. The important thing is it looks great and it looks right. 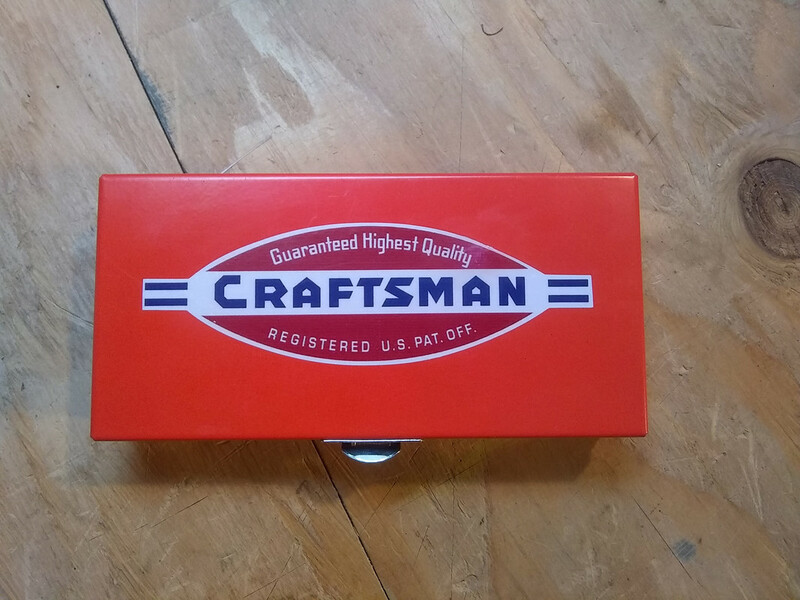 I like the crown logo, but = CRAFTSMAN = as seen in the logo is what's stamped on the tools after all and I find it more appropriate than the crown logo is.